A few months back, my mom gave me some money for my birthday that was to go to a private riding lesson. Well, it took me forever to schedule it, but I finally did. It was a bit tricky too, trying to work with work schedules and around when my instructor was teaching other lessons. In the end, we arranged it for a Friday morning. I was coming back from Tacoma, WA on a red-eye that morning at 8:15, and could easily head home, change and make it to the barn by 10:30 am. I got to the barn really tired (had to fly from SEA->SFO->ORD->CLE. Really.) but excited. I looked on the board and saw I was riding Donnie. I’ve been riding Murphy in my lessons for literally years at this point. So it was a bit nerve wracking to be on a new horse. Also, I had ridden Donnie once or twice before, and remembered him as being really fast. I’m nervous enough as it is, throwing fast into the mix just makes it worse. But hey, you put on your big-girl breeches and you ride. We spent most of the lesson working on my position. I have spent much of my riding career on horses that don’t have much of a “go” setting. Or rather, I was content to have them plod along, and thus I didn’t *make* them go. But, on occasion, I’d have to keep up with the rest of the group, so I had developed a habit of driving with my seat an posting really high at the trot to get the horse to go. (God forbid I use a whip, cause then the horse might *actually* move into a working trot!) Also, like most people, during scary moments I would inevitably lean forward out of fear. Which is the wrong answer. So I had been told time and time again to SIT BACK! Well, after years of this, I was now too far back, and posting too high rather than using my leg and/or a whip to get the horse forward. So we did lots of work on getting me into a better position, and thus working the horse into a better frame. It was a really great lesson! The only time Donnie ever got quick was when transitioning from the trot to the walk. Need to work on that. He feels you sit, and then gets speedy. I left happy, and incredibly sore. Who knew that shifting your position by a few millimeters would use all new muscles and leave you tender in your unmentionables? But it was a good lesson, and Marty even said she wished she could have videoed it! The next morning, I had my usual group lesson. This time, I was on Murphy, as usual. The other girls in my lesson didn’t show up, however, so I got another private lesson! This lesson focused again on my position, but we did spend more time working on getting Murphy into a nice frame and keeping her from popping out her left shoulder all the time. It was an exhausting lesson! And I left even more sore, with my unmentionables even more tender. The following week, I braved really cold temperatures and excessively snowy roads to make it to the barn for my regularly scheduled lesson. Turned out, I was the only one who did so, so another private lesson! And I was on Donnie again this time. Turns out someone in the lesson before mine was on Murphy. I’m a bit concerned; I tend to ride the same horse in really long (talking years here) streaks. Once I change horses, I tend not to go back. On the one hand, this might mean I’ve “graduated”! On the other, I’m going to miss my Murphy! She’s my baby! This lesson was less about my position (I’d like to think that it’s because for the most part my position was correct) and more about getting Donnie to bend to the right. 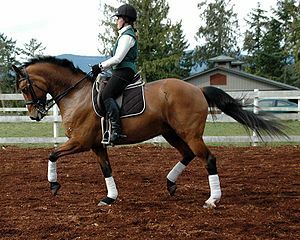 In fact, we spent most of the lesson going around in a circle to the right and getting him to go forward into the bit. I gotta say, the times when I got it right, I could feel it, and it was *amazing*! And it makes such a HUGE difference on the departs from walk to trot and trot to canter when you’re in that soft, collected place first! Marty repeatedly said that she was proud of me for this breakthrough. Despite being an adult (I’m generally twice as old as the other girls in my lesson groups!) I got all warm and fuzzy when she said that! *since I can’t ride and take pictures of myself at the same time, enjoy the horse eye candy of other people riding! This entry was posted in Be Happy, Don't Ignore Your Dreams and tagged Barn, Equestrian, Horse, Riding. Bookmark the permalink.